Will it be worth it to come back? Would I meet any new contacts or just the same people? Will the time and money investment pay off again? Each year you exhibit is a gamble and you never know whether it's going to work out. However, three months post-show, I can tell you that exhibiting for a second time at Surtex was absolutely the right decision for me. It's been about a year since my last recap from Surtex 2017's show and nearly everything I wrote in that post is still relevant this year. However, there were a few things I learned in my sophomore show at Surtex that I thought would be helpful, especially for those of you on the fence about exhibiting (or thinking about coming back to exhibit after taking a year or two off). In some ways, my second year at Surtex felt much like it did the first time: setting up the booth was still exhausting, several of the same exhibitors and buyers from 2017 were there, and Surtex was still using that awful orange carpet (and it still cast a weird glow on all my photos). But there were lots of changes I noticed too: it was cooler because we were on the 1st floor of the Javits instead of the 3rd, the Design District was split up and flanked both ends of the show, and instead of an after show mixer, they handed out beer and wine during the last two hours on Sunday and Monday. Sipping red wine at 4pm in my booth was quite the treat! However, most of that stuff is pretty frivolous when looking at the bigger picture. Exhibiting at Surtex is first and foremost about getting your work in front of art directors and buyers. It's about gaining momentum, licensing your work, and building a business you can eventually sustain yourself on. Unsurprisingly, it takes a LOT of time to prep for a show – especially in the final 3 months leading up to it. That's not something I gave much thought to when prepping for 2017's show, as I was new to surface design and didn't have any major clients at the same time. Instead, I poured all my time into creating as much portfolio work as I possibly could and designing everything needed for exhibiting at the show. Never at any point did I get overly concerned about not being able to finish everything on my to-do list. Fast forward to February 2018. I was busy prepping for the show again, however, I also had client projects (several with late March or April deadlines) and I ended up feeling very frazzled when May finally came along. Don't get me wrong, having client projects is great AND it's a crucial part of my business to continually receive commissions throughout the year. My big mistake was poor scheduling and setting unrealistic expectations on what I could feasibly accomplish at that time of year. So for Surtex 2019, you can bet I'm going to do things differently. Especially since the show's date has been moved up 3 months, it's now even more important that I protect my time and make sure I'm not overextending myself in the months leading up to the show. It makes sense that the closer your booth is to the front of the show, the more foot traffic you'll get. However, it's not a theory I could test until I had done the show for a second time. In 2017, I was about 15 booths back from the front of the show. I remember at the time feeling like the traffic was slow (mostly due to discussions with friends that had booths near the front – they saw many companies I never did). Compare that with 2018. The booth I got was much closer (about 6 booths from the front) and I noticed a huge difference, especially on the first day. By the end of the show, I had filled out over 50 intake forms (compared to just 37 last year). So my advice is to pick a booth as close to the front as you can. I should note here that Surtex does give priority to exhibitors based on the amount of years exhibited at the show (which seems fair) – so if it's your first time, don't be alarmed if you're placed near the back of the show. With that in mind, I also want to reiterate that even with the slow traffic, 2017's show was still a success for me. So your booth location isn't the only thing that matters. One thing I was genuinely concerned about when returning for my second year was the attendee traffic. I don't just mean the volume of people I'd see, but also whether they'd be new companies or mostly those I'd already met or worked with from last year's show. However, my fears were misplaced because at least 80% of those who stopped at my booth were new contacts. More interestingly, many of those people also attended last year's show and were surprised to hear that I had exhibited in 2017. The lesson here is that you can never predict who will stop by your booth and that the ever changing landscape of attendee traffic is actually a GOOD thing. Going into my third year, I realize that I will see different companies at the 2019 show and although not all of them will pan out, I know I will likely gain many valuable new contacts. You'd think that after your first show, you'd get over the fear of talking about your work and the first day jitters wouldn't be as intense. That's what I thought anyway. Boy, was I wrong! I was just as anxious this time around. Putting yourself out there is both mentally and emotionally exhausting. There are moments of pure joy when a buyer swoons over your designs, but there's also times when you want to hide under your counter after a really uncomfortable interaction. However, knowing that each show will give you butterflies and you can expect both negative and positive experiences is a bit freeing. And of course the good news here is that you're likely to have many more positive experiences than negatives during the course of a show. "More than ever, I feel like I’ve found my tribe: people who are warm, supportive, and exceptionally talented. To every single person I met and talked to, I’m grateful to have shared in your design journey, even if only for a brief moment." This year's show definitely convinced me that I'm in the right industry. Not only have I had the pleasure to work with some great new clients that I saw at Surtex, I've met some of the most kind-hearted and brilliant people on this planet through surface design. I am talking, of course, about my fellow designers. Of all the interactions I had at Surtex this year, nearly ALL of my favorites were with fellow designers, most especially with Lizzie, my accountability partner (and booth buddy). It's so rewarding to be part of an industry filled with friendly, talented people. And it's something I never want to lose sight of! My main focus in previous blogposts has been about the prep work that's involved with exhibiting, but I haven't really shared much about post-show work. And that's a something I want to change because I think it's actually the MOST important part! During this year's show, I'm happy to say I sold/licensed 2 designs. However, since Surtex I've worked on commissions from 4 new companies and licensed 6 designs. To put that into another perspective, the pieces sold during the show accounts for about 6.5% of my income for the year, yet my deals post-show account for nearly 40% (with the possibility that the percentage could be even higher come Dec 31st). This illustrates just how important it is to follow up with all those juicy leads from the show as most of the action happens in the months (and even years) following it. So even though you may be exhausted after coming home after exhibiting (rightfully so), don't shrug off that post-show work. Instead, set aside a few weeks and strategically work through all your contacts. You won't regret it! There's so much more I could say about exhibiting at Surtex, but I'm going to stop before I get too long winded (maybe it's already too late for that). As always, I hope you find my insights helpful for your own creative journey. I wish there was more information available to designers about exhibiting and I aim to do what I can to change that. If you have any questions about the show or any topics you'd like me to discuss, I'd love to hear from you in the comments below. I'm sure by now, you've heard the news: Surtex 2019 is moving to February. There were lots of mixed feelings about the change among exhibitors at this year's show. Frankly, it was the most talked about topic on the show floor. Many designers were already convinced they wouldn't return, while others were a bit more optimistic. No matter where you stand on the issue, I think it's important to take some time and think about how this change could affect us and our industry. That's why I put together a little pros and cons list of Surtex 2019 moving to February. I complied this list based on my conversations with exhibitors and buyers at both Surtex and Blueprint this year and tried my best to remain neutral when discussing each point, even though I've already made my decision (read to the end if you'd like to hear what I think). Cheaper Flights & Hotels: Every penny adds up when you're exhibiting at a trade show. Late May is the beginning of the summer travel season in NY and because of that, it's more expensive to fly to and stay in Manhattan. February, on the other hand, is considered "off-season", so it's possible to score better prices and save a little bit of money. An Earlier Show Could Mean More Sales: There doesn't seem to be a consensus on this, but I've heard from several people (both designers and buyers), that May is simply too late in the year for many companies to look for art. By pushing the show back 3 months, it gives us an opportunity to connect with companies who's buying season is earlier in the year. Access to NY Now Companies: Instead of exhibiting with the ICFF in May, Surtex will now be at the Javits during the NY Now show. At the January 2018 NY NOW show, there were 2,300+ exhibitors from multiple markets like home furnishings, gifts, and children's products. Conversely, ICFF's May 2018 show only featured 900+ exhibitors within a single market: home furnishings. The breadth of NY Now means we have the potential of reaching a much wider range of companies. Winter Weather in NYC: The average high during February in New York City is just 40 degrees – yikes! It's also the time of year when bad winter storms strike, causing travel delays and canceled flights. If the right storm comes along at the wrong time, we may be stranded in Manhattan afterwards or worse, not even make it to the show. Too Many Shows at the Same Time: There's an abundance of shows early in the year. Printsource takes place mid-January, as does the Gift Show in Atlanta, Creativation in Phoenix, and Heimtexil in Germany. There's also NYFW happening the week after Surtex. 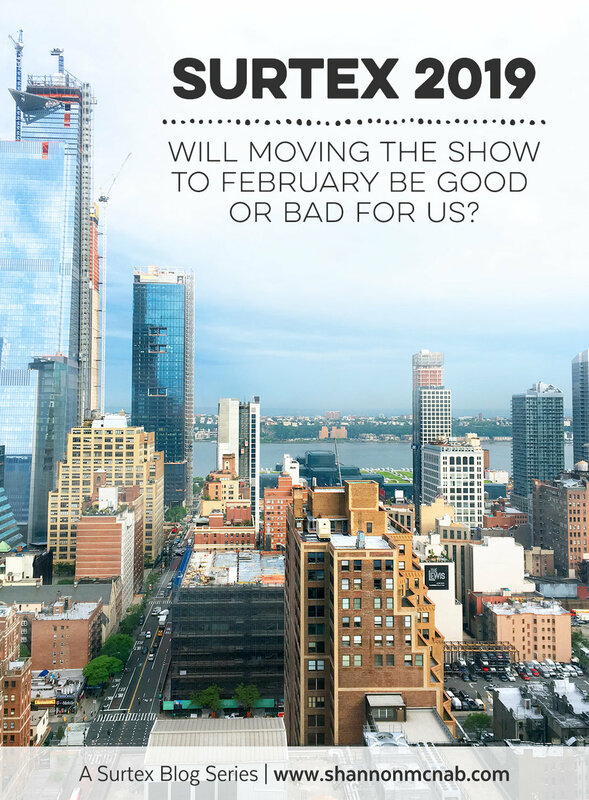 With all the shows happening around the same time, both exhibitors and buyers may have to choose one show over another because of time and budget restrictions. Less Time to Prepare for Next Year: At this moment, there's exactly 7 months and 2 days until Surtex 2019. To put that into perspective, at this same time last year we had 10.5 months. Think of how much new work you could accomplish with an extra 3.5 months? Less time to prepare will mean having less new work to show. 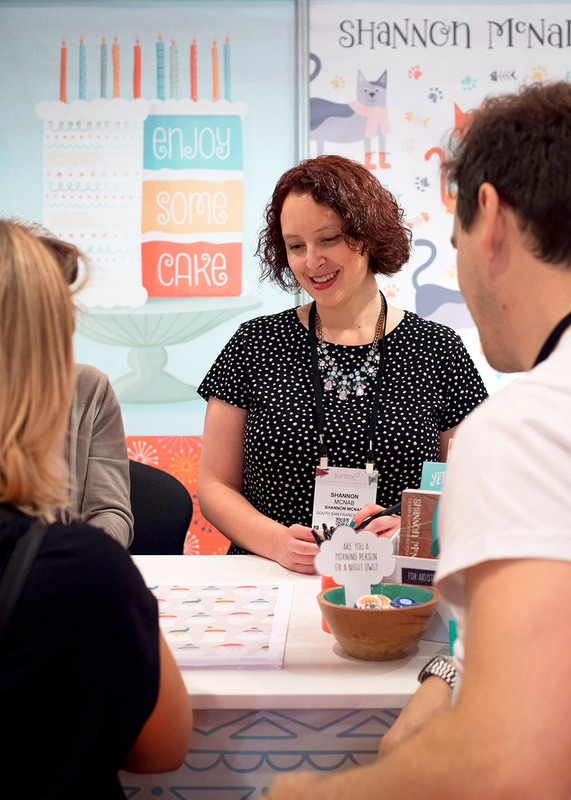 Of course the decision to exhibit at Surtex will ALWAYS be a personal one – each designer must decide what's best for them. But I hope that by discussing the potential problems and benefits of Surtex moving to February, it will at least make your decision a bit easier, especially if you're considering exhibiting next year. As I mentioned at the beginning, I've already made my decision – I plan on returning to Surtex in 2019. And while the thought that there's only seven months from now to prepare is freaking me out a bit.... ok, a LOT, I still believe I can have a successful show. What's most important to me is to keep the overall view of my business in mind when making these major decisions. The fact is, I made great new contacts at this year's show and am confident that I'll meet my income goal by the end of 2018 (my goal this year is almost double my income from 2017). I truly believe that if you put in the work and focus your energy where it needs to be (namely on consistently connecting with buyers and designing new work for my portfolio), it won't matter that the dates of Surtex have moved. It's all in how you approach it. You can either look at it as an opportunity or a disadvantage. For me, I'd prefer to view it as an opportunity! I'd love to hear what you think! What are your thoughts about Surtex moving to February? Love it? Hate it? Indifferent? Tell me in the comments below. P.S. I hope to write up my thoughts on this year's show, much like I did for 2017's show, a little later this summer. If you have any specific questions about exhibiting, please feel free to post them in the comments below or email me directly. By all accounts, my first time exhibiting at Surtex in 2017 was a success. I reached the goals I had set for myself, connected with lots of new-to-me companies looking for art, and finally had a chance to meet countless designers I "knew" online. But that doesn't mean there's no room for me to improve. On the contrary, my freshman experience at Surtex highlighted just how much more I have to learn about this wonderful industry. So as I'm gearing up for my second time at Surtex, I thought it would be fun to reflect on what I did last year and ways I hope to improve my experience this time around. This will hopefully be the first of several 2018 Surtex blogposts and just like my 2017 blog series, I hope to highlight aspects of the trade show experience that aren't as talked about so I can help others avoid the mistakes I made. Of all the aspects of Surtex preparations, the one area where I feel I have the potential to improve the most is my marketing efforts. Last time around, I spent very little time marketing myself to companies and looking back it was a huge missed opportunity. So I spent a few weeks at the beginning of the year, taking a closer look at what I did in 2017 and developing what I hope is a stronger marketing plan that will pay off for me at Surtex. But before I dive into what I'm doing differently this year, let me recap what I did last year and the lessons I learned. I spent a LOT of time creating lots of square Surtex images (seriously you guys, I made 11 of them) to post to Instagram in the two months leading up to the show. Of course they're pretty and visually represent my design style very well, but I'm not sure there was any benefit to doing so many simply because most of my IG followers are other designers and not brands I hope to work with. Looking back, I wish I had spent less time on creating these Instagram images and used that time elsewhere. I spent a couple of weeks last March creating a spreadsheet of companies I wanted to work with, researching their current product lines, and tracking art directors down with a month long LinkedIn Premium trial. But after all that hard work, the ONLY thing I did with the information I'd obtained was send them a single postcard in the mail announcing my Surtex debut. Ok, that's not entirely true. I actually did InMail message a few of them on LinkedIn, but didn't send a single email to any of them to introduce myself and my art prior to the show (mostly because I didn't have their email addresses). It's funny because at the time I was so incredibly proud of myself when I put the big batch of postcards in the mail, yet I didn't realize that the effort, time and money I spent was mostly wasted because A) many of the contacts I had weren't even the correct person to talk to and B) I didn't try and cultivate a relationship with them first. So if I had to pick one regret from last year's show, it would be that I didn't dedicate enough time to find the correct company contacts and start a dialogue with them prior to the show. "I'm Shannon, a surface designer from sunny California! 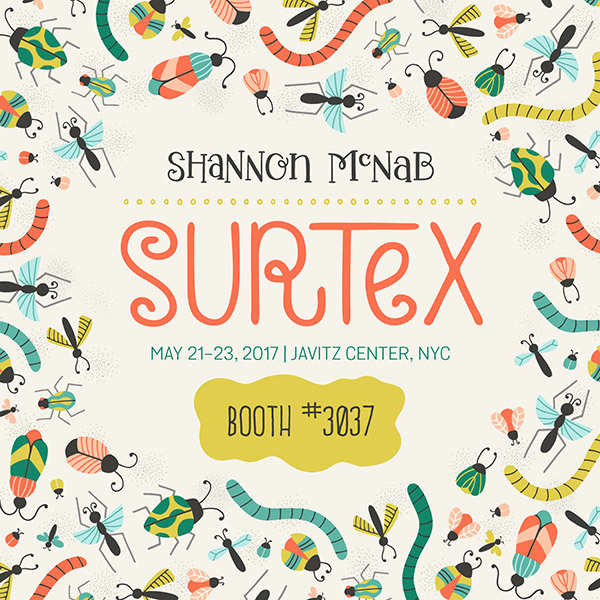 I'll be in New York making my Surtex debut and I'd love to meet you!" It can't get much simpler (or more boring) than that! I mentioned in my May 2017 blogpost that I kept things simple for a number of very good reasons, but what I failed to realize at the time was that I wasn't giving these art directors any important information about how I work or what makes me different from other designers. The surface design industry is incredibly competitive, with talented designers around every corner, so I was doing myself a HUGE disservice by not addressing the reasons why an art director should work with me over another designer. Since the beginning of the new year, I've been contacting new companies every other week. By starting earlier and working to build a relationship with them prior to the show, my hope is that more art directors and buyers will come to my booth and I'll receive more licensing and commission inquiries as a result. I feel it's equally important to build upon the client relationships I already have, especially for those I met at last year's show. I send out a newsletter with new art once every two weeks and also send individual follow up emails to my contacts once a month. By staying on their radar and showing them I'm still interested in collaborating, I hope they'll continue to work with and buy art from me. This one is the biggie! It is so important to me to make sure I'm contacting the RIGHT person. Tracking down contact information is time consuming enough as it is, so it's a waste if I'm taking a "shot in the dark" hoping I've found the right person. That's going to be my mantra anytime I get anxious about this process. I just have to keep in mind that it's a worthy endeavor and one that could potentially have an enormous impact on my career. My approach to my mailer is going to be a bit different this year as I want to make sure to articulate my strengths and what sets me apart from other designers. Of course that's nearly impossible to achieve in a single postcard, so my current plan is to create a small booklet with a little bit about my design strengths. It will showcase new art, cover some accomplishments I've made over the last year, and most importantly, have a space for me to write a hand written note to each recipient explaining why I'd love to work with them and their company. By being clear about who I am and what I can offer, my hope is that art directors will give my art some serious consideration and will decide to make the trip to Surtex to meet me in person and chat about surface design. Only time will tell if my new approach this year will pay off, but you can be sure I'll be blogging about it after the show! Today's post is the last of my three-part Surtex recap series and it's probably the most important one of all! Because while exhibiting at Surtex was a huge step for me, it doesn't matter much unless all the time and money I spent towards it helps propel my design career forward. That's why this post is all about the monetary costs of exhibiting at Surtex. Cost is such an important factor in deciding whether or not to participate in a trade show as it can literally make or break your business finances for the year, so I wanted to make sure to include it in my recap blog series. Trade show costs will always vary and what I've posted here are my own real costs associated with preparing for Surtex 2017. And while it's a bit nerve wracking posting something this personal, I feel it's important to be completely transparent with all the expenses related to exhibiting at a trade show. Since I started this series as a way to help others in their own journey, I felt it would be disingenuous to talk about costs without providing actual numbers. On the right is a screenshot of a cost analysis spreadsheet I created to track my 2017 Surtex expenses, broken up into four categories. And as an analytics nut, I also calculated the cost percentage for each category (to see where my money was going). Now before you shout "There is NO way I could afford to spend that much!" I want you to know that it is possible to exhibit at Surtex for significantly less than $9K. The 5x10 booth is part of the Design District which is only available to first time exhibitors. And while I did initially consider the 5x10 booth as a newbie, after seeing the 2016 booth configuration and the lack of privacy those exhibitors got, I decided on the 8x10 instead. It was absolutely the right decision for me, however, I know a few designers who exhibited in the Design District this year that are not only on their way to securing deals with buyers, but one has already received representation from a well known agency. So you could potentially save almost $1,500 from exhibiting in a 5x10 booth or even split an 8x10 booth like the girls at the Pattern Social and save about $2K. My husband joined me for Surtex, however, since accommodations are a necessity when traveling for work, the entire hotel bill during the trade show qualifies as a business expense (and can be deducted from my taxes). I'm a Best Western rewards member and although I could have stayed at a cheaper hotel, I decided to reserve a room at the closest Best Western to the Javits, which just happens to be one of their Premier hotels. So while it was more expensive than other hotels, I also benefited by racking up lots of reward points. Next year I will probably do things a bit differently and stay at a hotel that's much closer to the Javits. Also, a friend and fellow designer will likely be accompanying me which means we'll split the cost of the room 50/50. In the end, that will save me around $900. Business Cards: I mentioned this in the last post, but I panicked and bought 550 cards yet I needed WAY less than that! I wouldn't bother purchasing more than 200-300. Press Kit Cards: I felt like these were a waste of time and money. Instead, I'd rather just print a few more promotional postcards to have at my booth. Mailing Charges: I spent $70 just for 2-day shipping to get my initial set of banners to my friend's house (read the entire horror story here). Next time I know not to waste money with quick shipping and instead ship my stuff much earlier. Giveaways & Product Mockups: While I didn't go overboard with either, I still feel like I didn't need nearly as much as I had. Next year I plan on getting less product mockups made and only having 100 buttons to give away. While my costs for 2017 were nearly $9K, I plan to spend less for 2018. But I want you to know IT IS possible to exhibit at Surtex for around $5K (if you are in the Design District or share a booth with someone). Of course I realize that $5K is still A LOT of money and not everyone will have the business resources to immediately pony up that kind of cash. 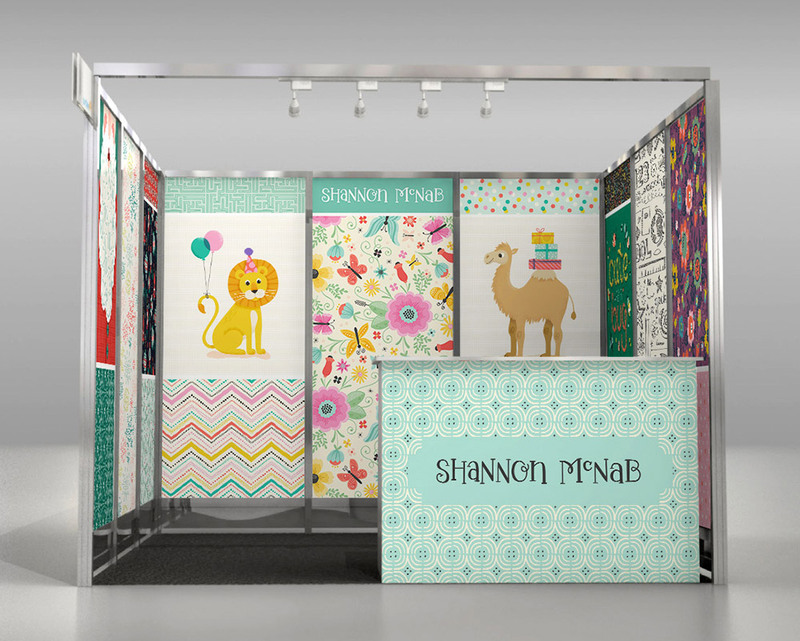 However, if exhibiting at a trade show is something you're seriously considering, I'd encourage you to spend a year or two saving up for it (like Nicole Tamarin did for her first time at Surtex in 2012). It's been exactly 3 months since Surtex and I purposely waited to discuss the show's cost and value last so I had a much time as possible to track how well I did as a result from exhibiting. So the real question is what did I gain from the $8,712.34 spent on exhibiting at Surtex? In the 3 months since Surtex, I've already secured contracts and commissions with more than 5 different companies and the income received will easily surpass my costs associated with Surtex 2017. So yes, the financial gamble I took when I decided to exhibit has DEFINITELY paid off! Company Contacts: Hunting down contact info is a tedious process. And even if you find it and cold call or email them, there's no guarantee you'll hear back or that you've contacted the right person. But at Surtex, you are literally in front of hundreds of companies in the span of 3 days AND you can actually get their correct contact info. Also, in the fast paced, internet age we live in, there's something to be said for having in-person conversations. I feel these connections make all those who choose to exhibit, much stronger candidates to companies looking for designs. Great Market Research: Not only do you get to see what trends are dominating other designers' booths, you also get to hear what themes companies are looking for. My favorite question to ask buyers was "What are you looking for?" People who are interested in your work will be really candid and specific with what they want, so I came home with a list of motifs I'm hoping to add to my portfolio over the next year. For example, several companies asked for cacti and so the first new portfolio piece I designed after I got home was a cactus themed pattern (see above). I'm happy to report that it's already been licensed to a Brazilian fabric company. Building Community Ties: 90% of the time, I work at home. Being constantly by myself can get lonely and that's why I am so thankful for all the connections I made with fellow designers at Surtex. Since we're all dealing with the same challenges, exhibiting at a show brings you together in a unique way. I was happily surprised to bond with several designers and look forward to seeing them at the show next year! I realize that was a lot of information to take in, so if you made it to the end... bravo!!! I hope you've enjoyed my post-Surtex blog series and that it's given you some insight into how to make a trade show experience successful. I'd like to continue blogging about trade shows and touch on things I haven't had a chance to yet, but I think I'll take a few months break from it for now so I can once again focus on building up my portfolio for next year's show (yup, I'm already signed up for 2018)! If there's anything you'd like me to discuss in future posts, please feel free to post them in the comments below. 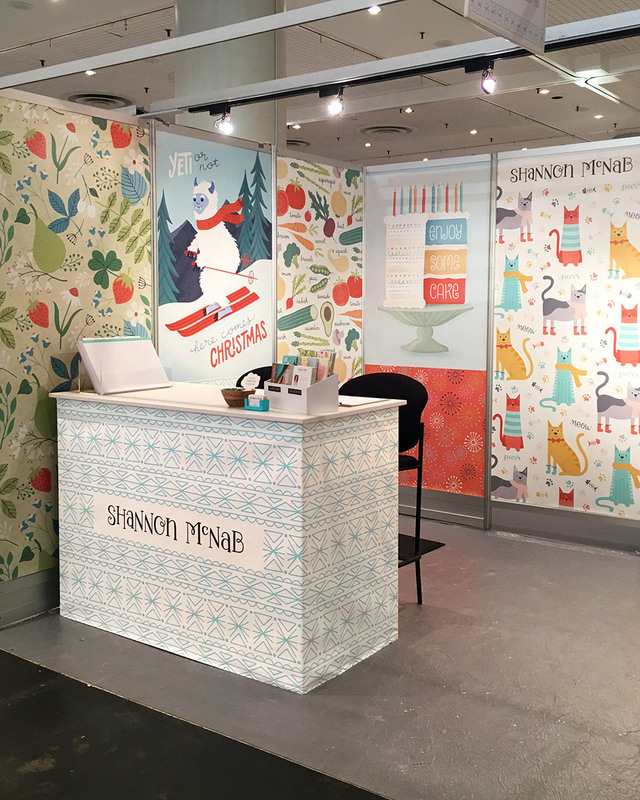 Surtex 2017 Recap Part 2: Was it Successful? NOTE: This post contains affiliate links. I never promote anything I don’t love and use myself. And although I may earn a small commission for sending business their way, there’s no cost to you! I want to start off by saying that I hope you're finding this blog series helpful! I created it because when I went hunting for information last summer, there were lots of details and aspects of the show I simply couldn't find. So for me, if I can help make someone else's journey to their first trade show a wee bit easier, then that makes me happy! Well, it's been a few weeks since my last Surtex recap post and I thought it was about time I get to the "good stuff" (ie. talking about how exhibiting actually went for me). If you missed my last post, I discussed my pre-Surtex booth setup and shared lots of things I wish I had known ahead of time about setup. Deciding to show at Surtex when I am new to the surface design industry felt like a huge (and expensive) gamble, but I also knew it was likely the best option to get my art in front of many companies in a short amount of time. So I'm not surprised that the most common question I've received since showing at Surtex has been "Was it worth it??" And my answer is: HECK YEAH!! Goal #1: Attempt to strike up a conversation with at least 50% of the people who walk past my booth. About 70% of the people who walked by were either fellow exhibitors, buyers looking for art in a completely different style, or people going to the adjacent furniture show. The other 30% were companies/buyers who were actually interested. Of those that seemed interested, I made it a point to strike up a conversation with nearly all of them. And those that weren't? I attempted to at least give a warm smile and hello if they looked into the booth. Goal accomplished: YES! Goal #2: Come home with at least 20 solid leads of people/companies I'd like to work with. After tallying all the intake forms I came home with, I ended up with a total of 37 leads. Of those, I'd consider 24 of them solid leads (and 9 that I'd be over the moon excited to work with). Will all these great leads pan out? No, but I'm ok with that. Goal accomplished: YES! Goal #3: Sell/license 3 portfolio pieces during the show. By far my most difficult goal to accomplish, especially as a newbie, but I'm happy to say that I mostly completed this goal. What do I mean by "mostly"? Well, a company purchased licenses for two of my illustrations at the show, but wanted another to complement it, so they commissioned me for a third piece. So while I didn't technically sell 3 licenses at the show, I felt confident I would achieve it within a few weeks. Goal accomplished: Let's say YES! It was a great feeling at the end of the show to know that I had accomplished all of my goals, most especially because I had made enough to pay for part of my booth fee! In order to protect your work as much as possible, you need to file copyright applications in a timely manner. According to copyright.gov, "timely" is considered within 3 months of publication of/offer to sell your work. So I registered all my designs in early May so I am protected in the event that someone copies the work that I presented at Surtex. I mentioned this a bit in my May Surtex post, but felt it deserved to be mentioned again here. I printed 50 of my press rack cards; we left 25 in the press room and had 25 at my booth. My husband checked Tuesday morning (the last day of the show) to see how many were left in the press room and only ONE had been taken! Next year, I think I would completely forego creating press kit cards and instead just focus on a promotional postcard or small booklet that showcases my work. I'd probably still put 5 or so in the press room (just in case), but would keep most of them in my booth to hand out to the buyers. There was a big discussion in the Advice for Artists FB group about what types of shoes were best for the long hours of standing at the show. Many had great suggestions, but my favorite recommendation was from Sandy; she uses an anti-fatigue mat in her booth to stand on. As someone who suffers from arthritis in my ankles and hips, I knew orthopedic shoes wouldn't be enough for me so I scoured Amazon for the best, compact mat I could find (see direct link below in vendor list). It fit perfectly flat inside my checked baggage and was so helpful at making my legs and feet less achy at the end of the day. This is something Jennifer mentioned often in her Prep Talks and I'm so glad I heeded her advice. Coming from a scrapbooking design background, I'm used to creating large collections usually consisting of 6-12 patterns. However, such large groupings can be tough to sell simply because you have to sell them at a higher price (to make your time investment to create them worth it). Most buyers I talked to had fairly specific budgets for purchasing work, so having smaller collections made it easier to license and sell my work. Plus, by showcasing one main illustration or hero pattern with a few coordinates makes the customer feel like they are still getting a lot for the price. At least that was my experience at the show. I initially purchased 250 business cards from Moo, but heard that you need to have at least 500 cards so you don't run out. So I panicked and purchased 300 extra cards from Zazzle as a precaution. Now I don't know if it's because of where I was on the show floor (I was near the back) or if it's because attendance was down for buyers, but only about 120 were picked up at my booth. That means I came home with 400+ leftovers and never needed to purchase extras from Zazzle. Especially when flying from CA where space in my luggage was precious, I have to say I was a bit annoyed I wasted so much of it on business cards. Next time, I'll probably just buy 100 new ones and then supplement with my extra Moo cards from this year (which will save me money too). Companies you absolutely want to work with. Companies that you could see yourself working with. Companies you may or may not want to work with. Over the course of the three days, you talk to so many people and all the details and excitement will start blending together. So after the end of each interaction with a new buyer at my booth, I would mark which group they fit into on the top of the intake form. I had a file folder for each grouping so everything stayed organized behind the counter. Also included on my product shelf were samples from scrapbook products I designed from Becky Higgins LLC & Echo Park Paper Co. I hope you enjoyed my second Surtex 2017 recap blogpost. The third and final post will be all about the costs and value of exhibiting at Surtex. Since cost seems to be the #1 factor in deciding whether or not to participate in a trade show, I feel it's a really important topic to address. May 2017: Ready or Not, Here I Come!